Create the basic two-loop system (opening A, drop the thumb loops). 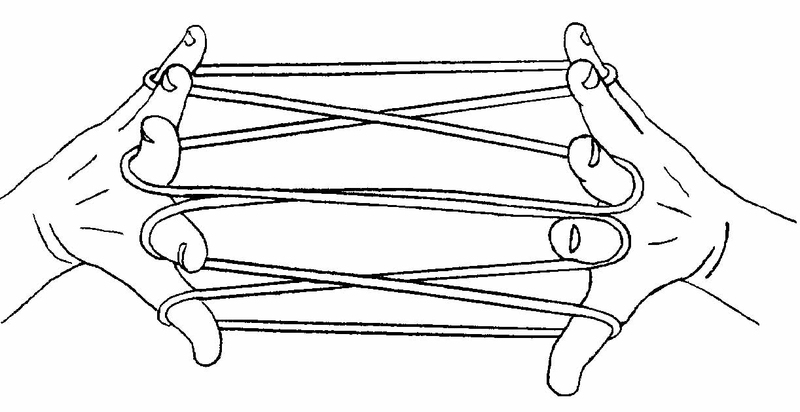 To katilluik the index loops, bring the hands together, insert the right index, from below, into the left index loop and lift it off the left index entirely; then insert the left index (which is now free of loops), from below, into both loops on the right index finger and separate the hands. You now have two loops on each index, one of which has a transverse far string. To katilluik the little finger loops, bring the hands together, insert the right little finger, from below, into the left little finger loop and lift it off the left little finger entirely; then insert the left little finger (which is now free of loops), from below, into both loops on the right little finger and separate the hands. You now have two loops on each little finger, one of which has a transverse near string. Now try forming Osage Two Diamonds with this loom, treating all doubled strings as single strings. The result is double katilluik two diamonds: a two diamond pattern with double framework strings and two parallel transverse strings running across the center (fig. 21). Double katilluik one diamond actually has three diamonds, and central transverse strings which loop around the framework strings (fig. 22). Double katilluik three diamonds also has three diamonds, but the central transverse strings are now woven into the inner design (fig. 23). Double katilluik four diamonds resembles the two-diamond equivalent (fig. 24). Once these variations are mastered, i encourage my students to experiment with a two-loop loom in which only the index or only the little finger loops are doubled using the katilluik move ( single katilluik two-loop looms). When the former case is applied to jacob’s ladder, a four-diamond figure crossed by a single central transverse results, as shown in fig. 25 (take care to retrieve only the non-transverse far index string in the second step of the weaving phase). Alternatively, one can start with a double katilluik two-loop loom, but pick up only one strand of each double string during subsequent weaving steps. A little experimentation with Jacob’s Ladder leads to a pleasing pattern with two central transverse strings (fig. 26). 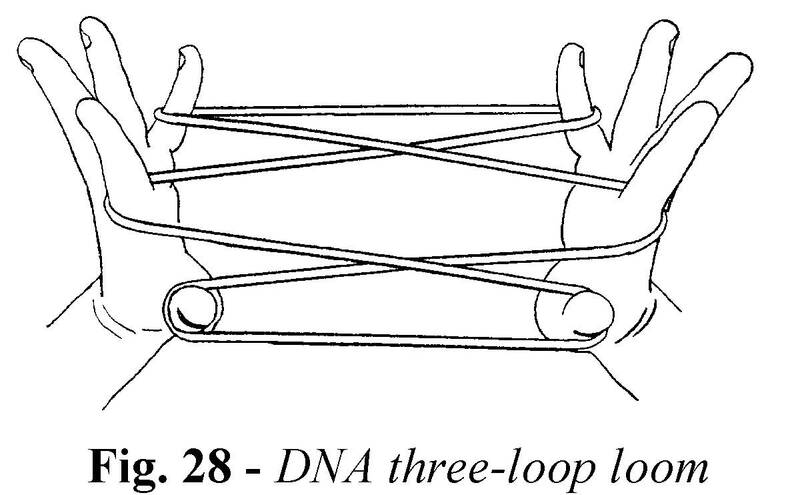 To form the dna opening first make opening A, then drop the thumb loops to give a two-loop loom. Insert the right thumb, from above, into the left index loop and return with the left near index string. A tight circlet of string forms around the right thumb. Insert the left thumb, from below, into the right thumb loop (the circlet) and separate the hands. The result (fig. 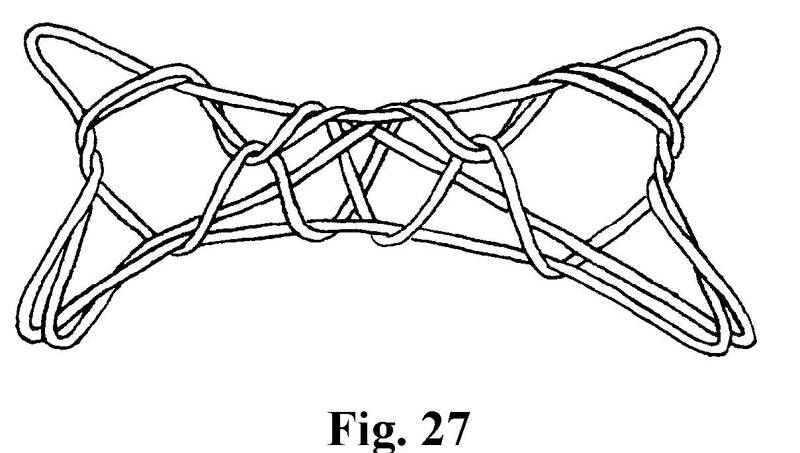 28), resembles Opening A, but if you point the fingers of the right hand away from you, you will notice that none of the strings touch, and that the figure is somewhat reminiscent of a dna spiral. 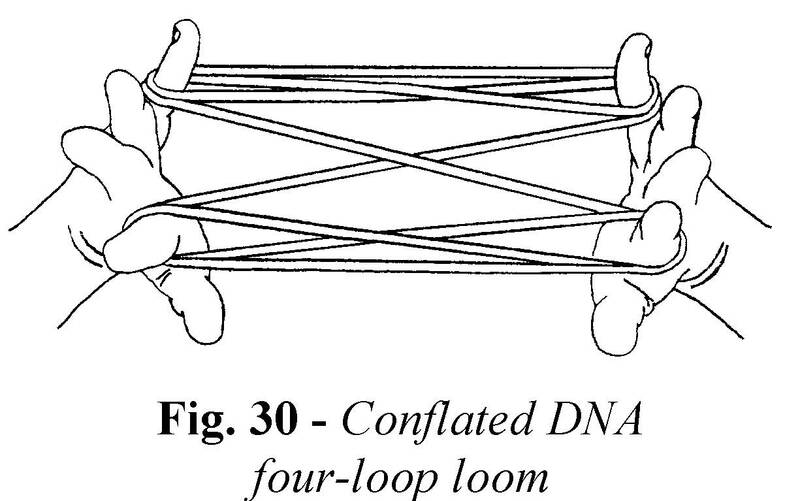 This i call a dna three-loop loom, and specifically the right dna or rdna three loop loom. Now that you have discovered that complexity has its quirks, it might be time to make more sense out of the topology of the situation. one aspect of topology deals with the surface of a figure like the long skinny torus that a string is, and how the different parts of the surface touch each other after the torus has been flexed on the hands to make the four dimensional vector that a finished figure represents as it is viewed on the hands.